Seems I am becoming a little addicted to these challenges - they are such great inspiration when I am sitting at my desk staring at a blank card. 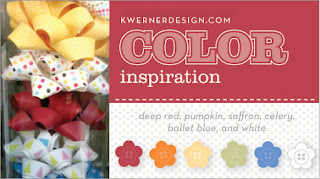 This week I have played along with Kristina Werner's 56th Color Inspiration Challenge - here. Here is the card I came up with. I absolutely love doing scenic cards - I like them to be able to tell a little story. Marisa at Create on Garden gave me the fabulous ribbon I used for the stems with the gorgeous leaves - she wanted to see what I could create. It is perfect for flower stems. I used one of my favourite Hero Arts stamps - the Cloud design block, but I don't know the brand of the stamp i used for the flowers. The sun stamp came from my 4 year old son's stash. I gave him his own farm animal set of stamps, and they are just so darn cute - and the sun was perfect!. Really cute, love it ! This is just too cute! 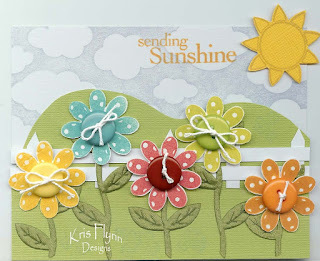 I love how you used the leaf ribbon and the flowers are adorable! Great card! Love your fun scene and the fabulous use of buttons. Great job with the color combo. This is the cuttest thing I have ever seen!! WOW! Great job with Kristina's color challenge! I love this! So cute and colorful! This is so happy and fun! Love it! !